This five piece reversible comforter set is very comfortable, the material is soft and the comforter has just the right amount of cushion to it. I love that it is reversible, the purple's are vibrant and the blue side changes the room to give it a more masculine feel which is helpful for couples trying to compromise on bedroom decor. The pillows are adorable and the whole set was very affordable. I definitely recommend this comforter set to anyone, this was one of my favorite purchases to date. The Emmi 5 Piece Reversible Print Comforter Set, by 510 Design, brings a touch of beauty and elegance to your bedroom decor. 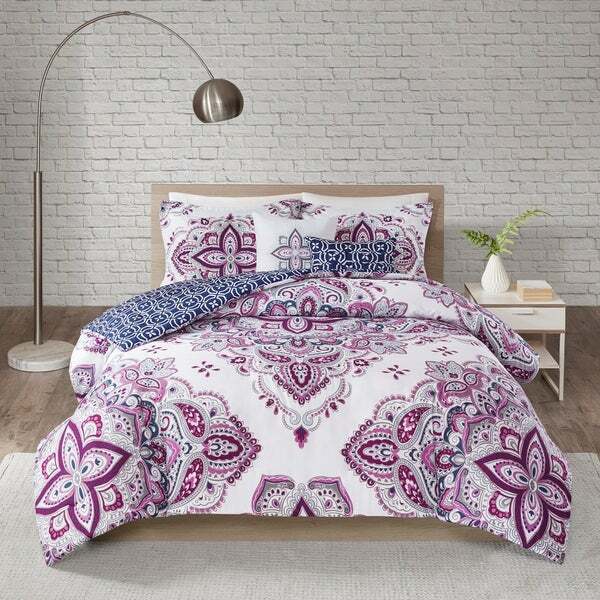 This ultra-soft microfiber comforter features an oversized globally-inspired medallion design in beautiful hues, while the reverse displays a repeating medallion print for a striking modern appeal. The two shams match the design on the reverse of the comforter to create a one-of-a-kind look. Also included are two decorative pillows with embroidered details that provide the perfect finishing touches to the bedding set. Machine washable, this reversible print comforter set is sure to brighten up your bedroom with its contemporary charm. "Are the two shams reversible as well?or are they just one solid design? If so which design? "